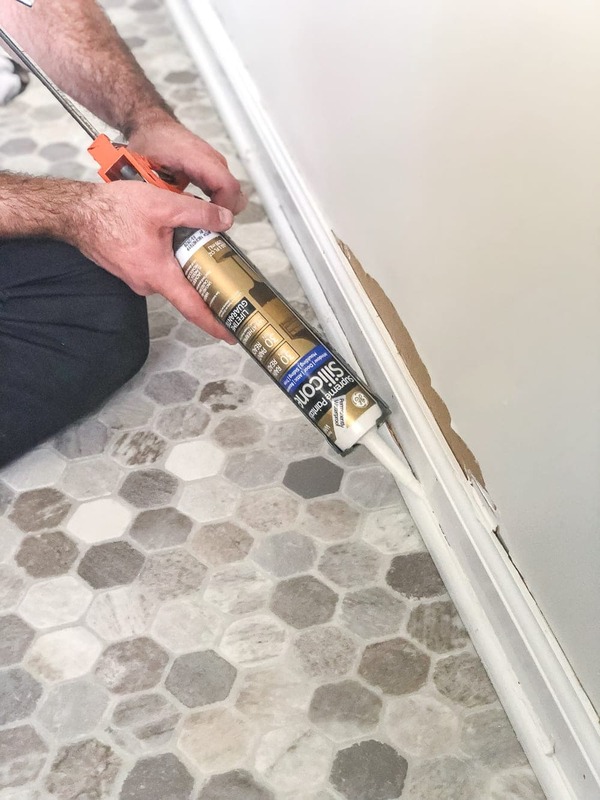 All of the supplies and steps you need for installing sheet vinyl flooring over old tile yourself for a temporary fix. Favorite project EVER! Okay, I say that about probably 50% of every project we do around here, but this one is definitely up there on the charts of most-transformative-for-least-amount-of-money. 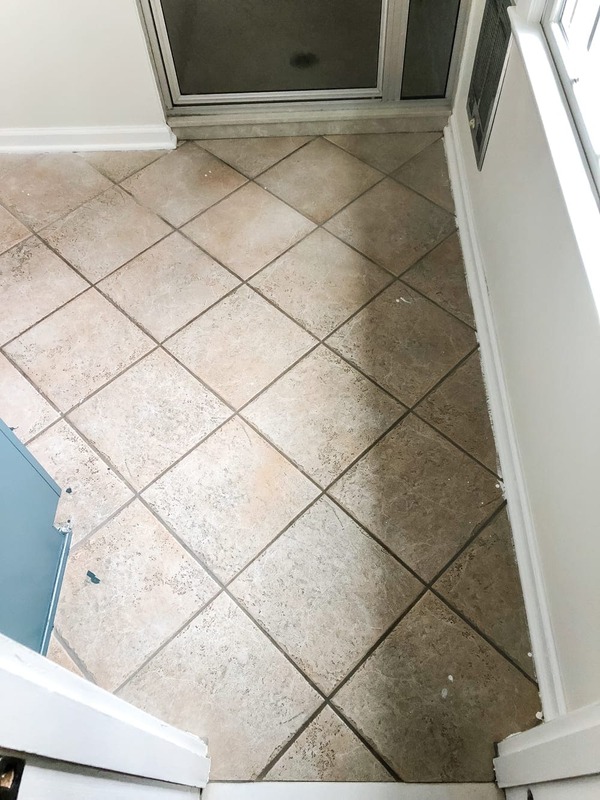 Even though we had rescued the ceramic tile in our kitchen and hallway bathroom using grout pen in the past, this floor seemed a little farther gone. 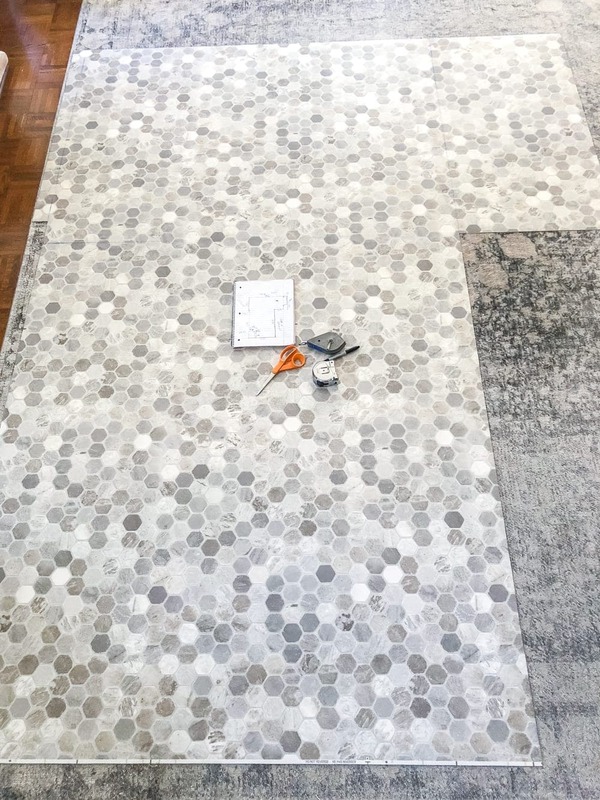 And since we were sticking with the existing countertop and shower for now (until a real gut/renovation down the road), I wanted a floor that would modernize the 80s beige a little better. Except I wanted to steer clear of tile paint and the stenciling route like so many DIYers have been doing here lately. With a 3 month old in the house, I wasn’t loving the idea of fumes and I wanted this job to be quick and the install done in a matter of an hour or two. Normally, if you were doing a major renovation, I would NOT suggest putting vinyl floor on top of tile. I think for a permanent floor, it should be done the “right” way. But for a quick Phase 1 fix, it’s a great DIY-able solution to carry you through until you’re ready for a messy contractor job. 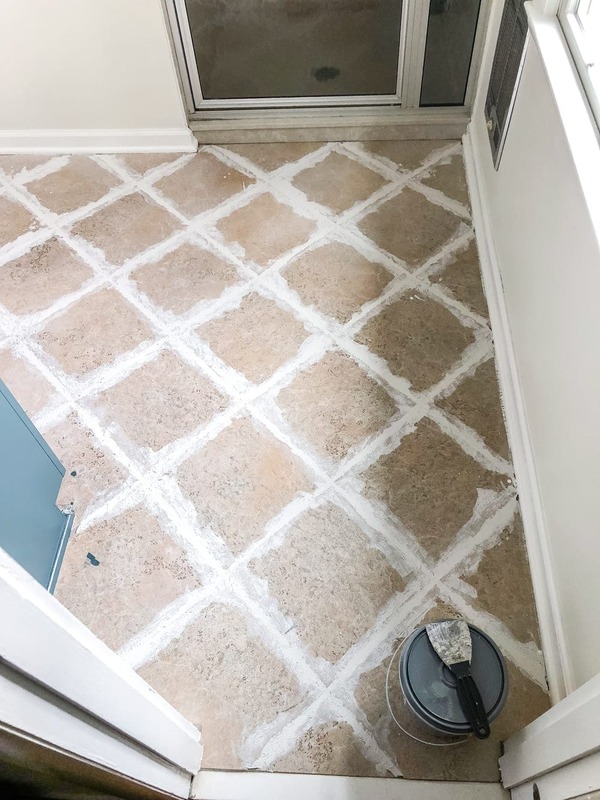 So if you’re wanting to do the same thing to some of your existing tile floors that have seen better days, here’s how we made it happen. 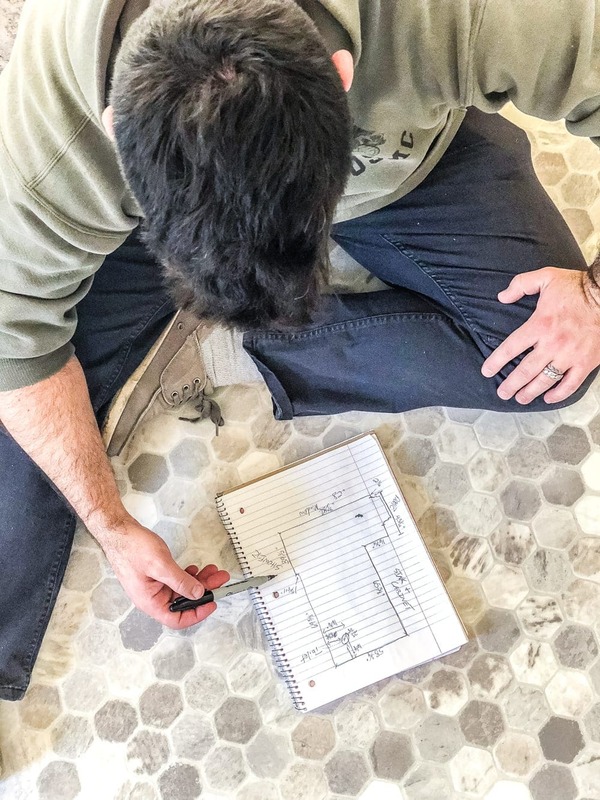 Because you don’t want your sheet vinyl to settle into cracks and grooves in your subfloor over time, patch everything in your tile to create a smooth surface. Our tile was in great shape, so I just had to fill the grout lines with thin-set mortar using a putty knife. Try to apply it as smoothly as possible. 2. 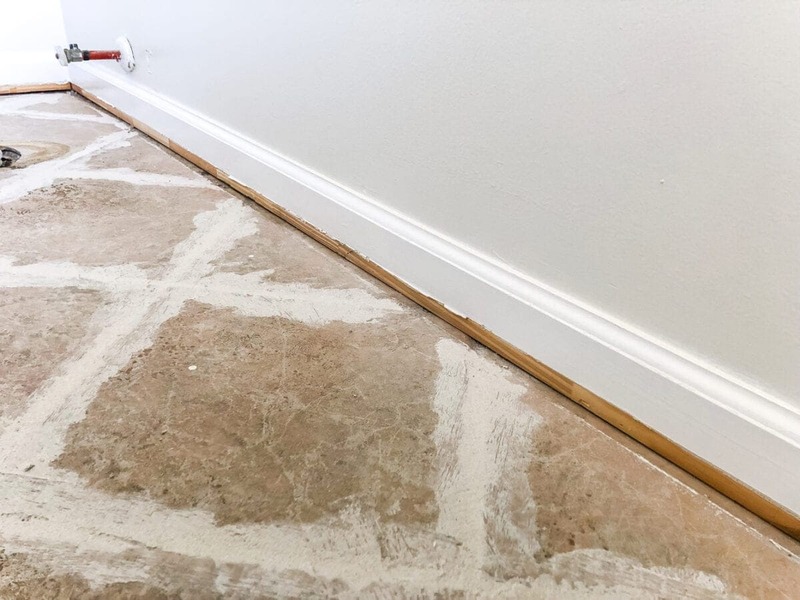 Once the mortar is dry in about 24-48 hours, you can sand any rough spots with medium grit sandpaper. 3. Sweep the floor and remove any debris with a dust pan since you don’t want to trap anything under your sheet vinyl floor. 4. 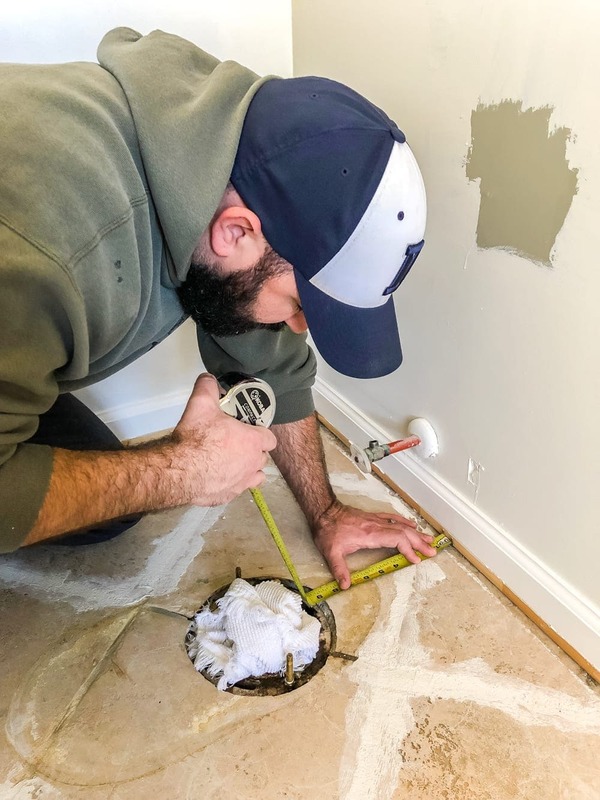 Remove quarter round and baseboards with a crowbar and mallet or hammer. Here’s a post to help you with it, if you’ve never done it before. Set the quarter round trim and baseboards aside to reinstall after the sheet vinyl is in (assuming they’re in good condition). Include measurements of any obstacles in the room as well. We removed our old toilet beforehand (this is a great video for toilet removal with a good tip to prevent water dripping everywhere), so we measured where to cut a hole in our sheet vinyl for that as well. 6. 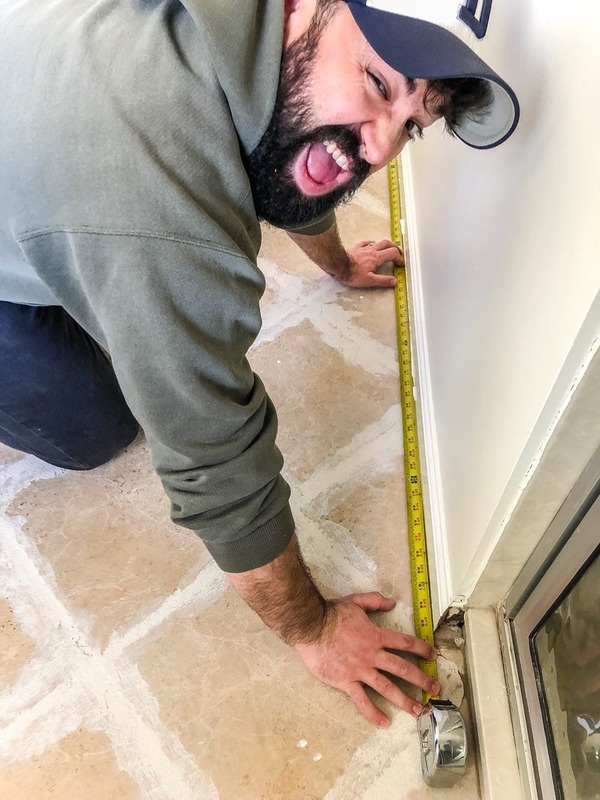 Measure twice and double check that all of your measurements are correct on your diagram. 7. Roll out your sheet vinyl and take a nap. Just kidding. 😉 Well… if you do, we won’t blame you. But at least roll out the sheet vinyl (do NOT flip it upside-down for measuring/cutting in the next step). 8. Use your diagram as a reference to mark your measurements using the tape measure onto the edges of the sheet vinyl to create a template. 9. 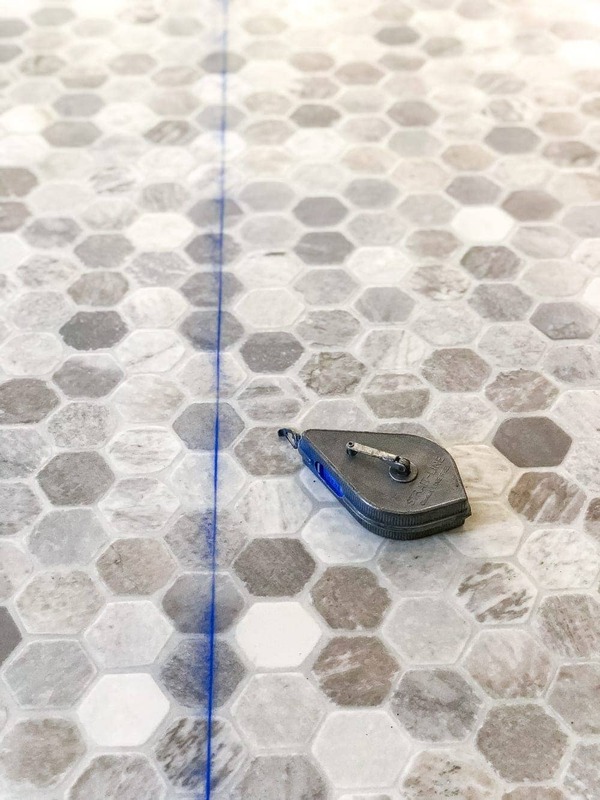 Mark your lines between your measurements for the perimeter of your room with a chalk line. 10. 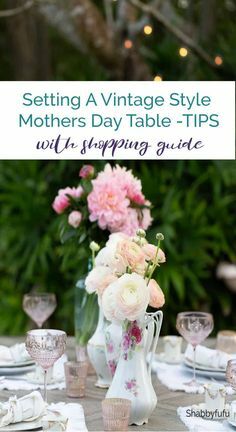 And cut the sheet vinyl with sharp scissors or a utility knife. 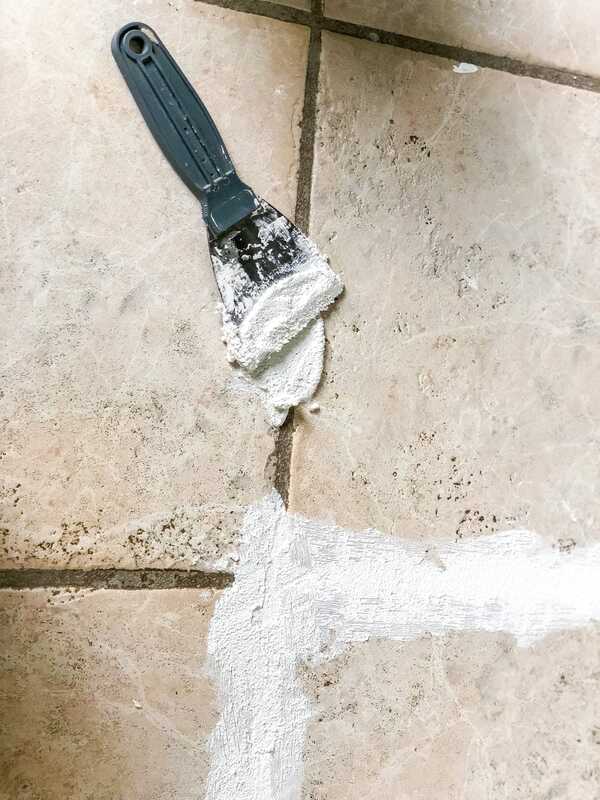 After your floor is cut, wipe up any remaining chalk line (Mr. Clean Magic Erasers work great). 11. 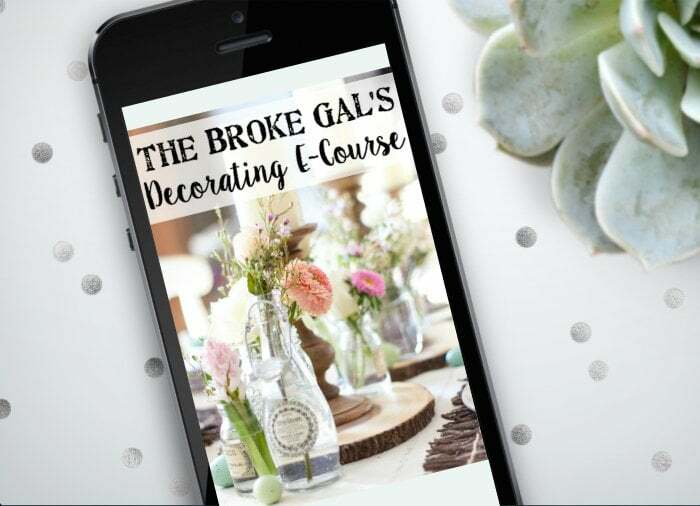 Haul your cut sheet vinyl into the room and roll it out. Trim any remaining spots with a utility knife as needed as you position it into the room. 13. Then, apply white silicone caulk to fill cracks on the reinstalled trim. And attach sheet vinyl edging to where it meets up at a shower/tub/door threshold too. But with the mix of warm and cool tones in this floor, I feel like it makes the blue and beige cohesive. So now next on the agenda is to patch, touch up a little paint, and install a new toilet (because the old one desperately needed to be hauled out for good). I’ll be painting the door Benjamin Moore Wrought Iron this week to match the rest of the ones in the house that are already that deep charcoal color. 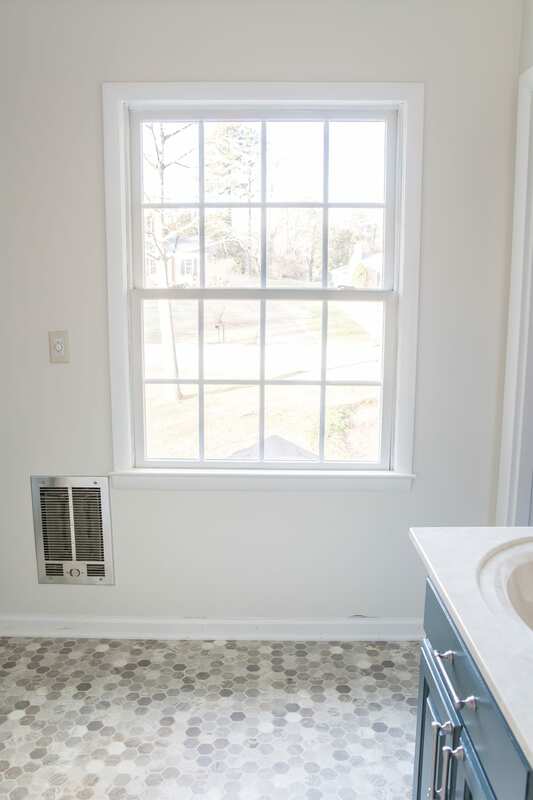 And I’ll be hanging up a window shade so that the whole neighborhood doesn’t get a peep show when we actually are able to use this bathroom again. Ha! And we’ll be hanging up new mirrors and installing a new vanity light this week too. I keep debating on whether or not I should hang a long shower curtain in front of this shower door to camouflage it though. What do you think? Cover it up or leave it? We’re finally in the home stretch over here! And then we’ll be gearing up for our first major renovation elsewhere in the house that I can’t wait to show y’all. Eek!!! One thing at a time though. That is nice vinyl. Looks great installed! That looks great! I’ve been considering getting sheet vinyl. Definitely easier than painting tile! 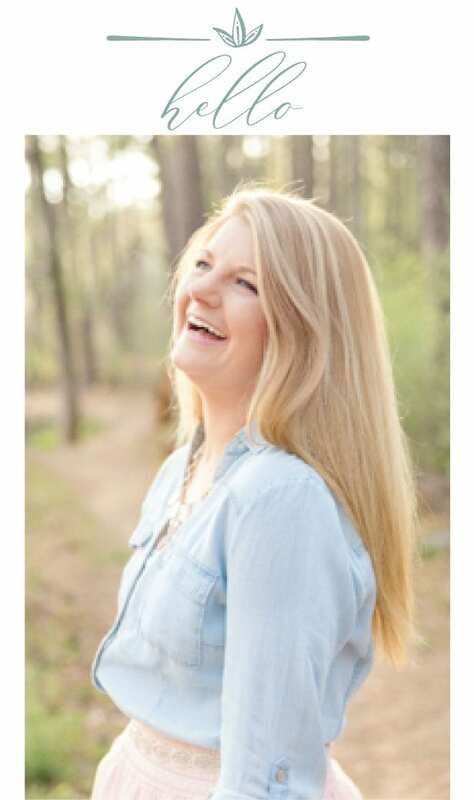 Wow, what a difference, Lauren! I’m in a rental and my bathroom tile is horrendous. It’s 2″x2″ dingy brown squares that have been in this NY apartment for probably at least 4 decades. 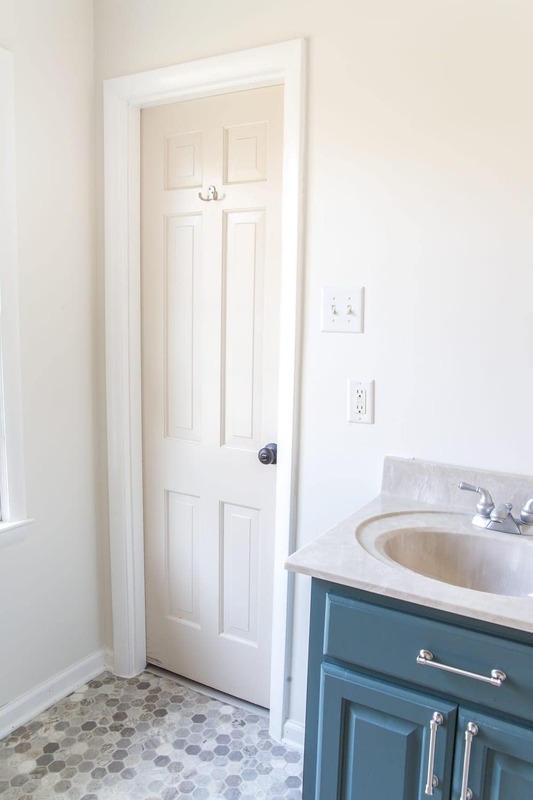 It’s a tiny bathroom and I wouldn’t even know how to begin taking out a toilet but would you still recommend the same method with somehow cutting it around the toilet? Absolutely! You can still cheat it around. It would definitely be more challenging, but it can be done. HUGE difference and it looks awesome! I like semi-permanent floors better in bathrooms anyway for the cleanliness and optional changeouts. This was a great pick!!! Looks great! 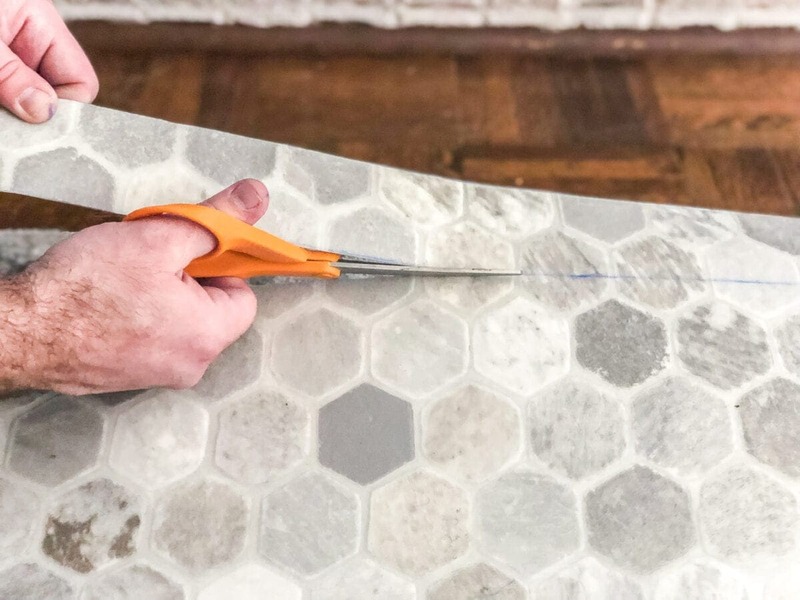 Do you think you could use the same peel and stick that you used in your laundry room over the ceramic tiles? 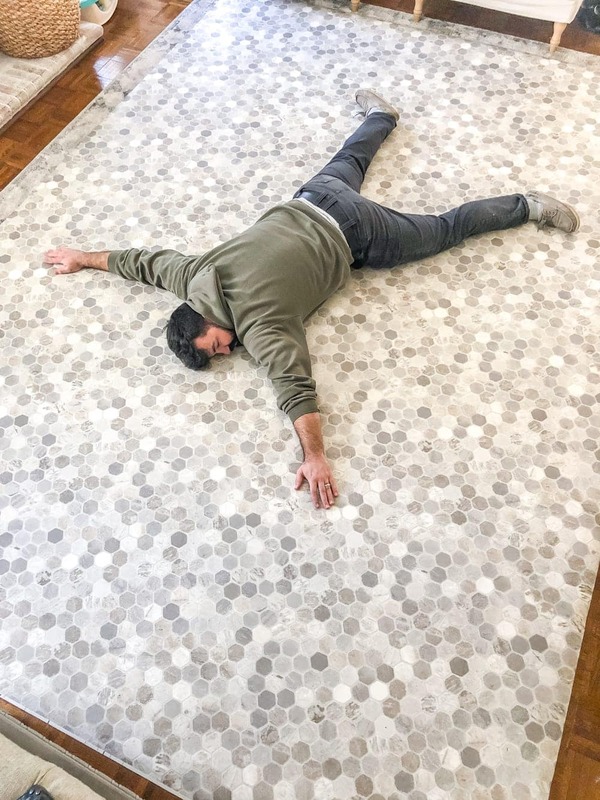 Lauren, you guys did a fabulous job – that floor looks amazing! Lauren, great job on the vinyl. Seeing the heater grate made me want to ask you a question. Do you have any suggestions for either DIY or purchased replacements for those ugly white cold air returns. We have one in the den and one in the formal living area. They are 20 x 25, so really stand out like a sore thumb. I know I have to have an opening and grate but just hate that white slatted one. Appreciate any suggestions. PS – I put a shower curtain in front of our shower because the stainless steel tracks were so tarnished. I don’t, but I should look into something for that! That heater drives me totally crazy. We don’t use ours and have never even turned it on for fear the thing might just blow up. Haha! Thinking by putting a shower curtain in it might make the room feel much smaller. Think it would be up to how you feel it makes the room look. The shower frame goes with the other finishes in the room so I think it looks fine without. Thanks so much for your input, Linda! Well I’m thinking curtain in a wonderful Toile. I have an aversion to glass showers. Just my personal take. That is a great project, and it looks like it came out flawlessly. I also agree that as a phase 1 DIY, this approach allows fow a rapid brightening of the floor, with moderate term longevity. You used the term thinset mortar. Your pictures show thinset mastic. In my experience the differences are stark. Thinset mortar is a cementuous based product. Thinset mastic is a latex/acrylic based with water clean up. I used mastic one time to set a floor, and will never do it again. Being water based, I would caution anyone using it on a floor, especially in a water environment to not use it, and instead got with a vinyl cement floor leveling compound. If you chose to use the mastic, I would increase the dry time to ash much as 96 hours. 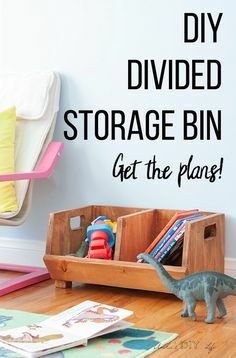 Again, great DIY to allow for updated feel, while planning the major phase 2 / 3 projects. Hmmm… are you sure? The container says “thin-set mortar”. I just used a white mortar, so maybe it just looks like mastic in photos? It’s definitely cement-based. 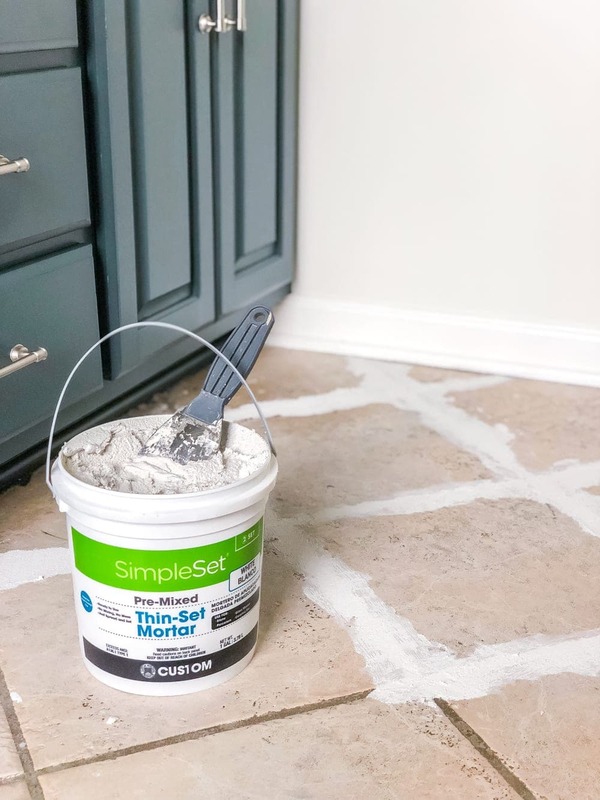 I read the tip from Bob Vila to use thin-set mortar to fill grout to prep the floor for vinyl. Beautiful job! You asked if you should put a curtain rod covering the shower door. because the pretty windows are adjacent, it’s a lot of glass. I’d try it and see if you like it. Thank you for the inspiring information! Thanks, Cindy! I think I might take a curtain for a test drive, just to see. Couldn’t hurt! The floor looks great, and it all certainly looks coordinated and intended. I would go without the shower curtain..keep it crisp. And, with a tot to care for, one less thing to maintain. Looking good. The counter top seems to be a part of the room rather than standing out with the new paint and flooring. I think the shower is fine. A shower curtain will make the shower area feel darker and with your new blinds it just won’t fit. It seems a part of the plan so I would leave it alone until your big renovation. 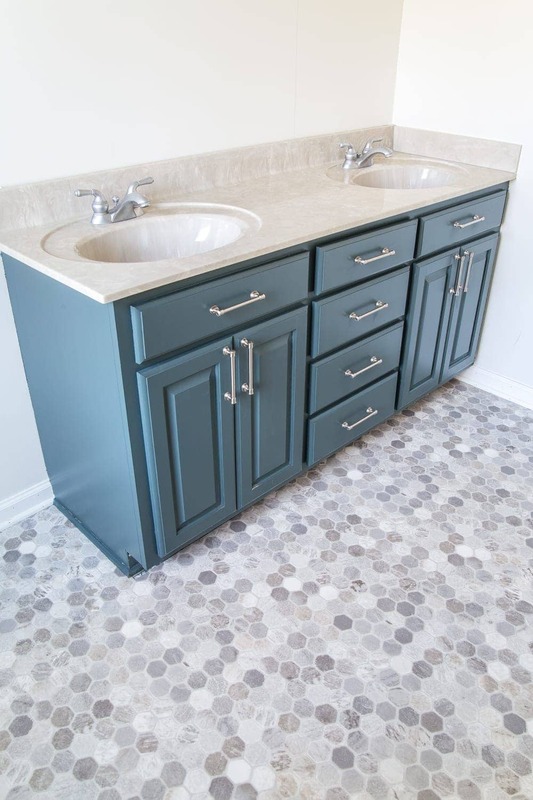 I am remodeling my bathroom and I love the vinyl pattern and colors that you installed. Where did you get it from? Your input would be greatly appreciated. Great job!!!! Good luck on your project. It seems we are tackling the same beast. 🙂 The flooring came from American Carpet Wholesalers. Skip the shower curtain. More modern without it. Everything is looking great! Looks great. I don’t know anything about flooring but I was really surprised you didn’t use adhesive. Makes it seem so easy. Thanks. I thought that was odd too, but it was the manufacturer’s instructions not to use adhesive. The underside has a grippy, rubbery feel to keep it from moving and the baseboards are what is supposed to hold it in place. It’s definitely not budging. But that bit would vary, depending on the floor’s manufacturing instructions. LOVE IT!! Do you think this could be applied to the tiles that are really small? Yours are larger than my tiles. As long as you can fill lines and smooth out the floor, absolutely! Nice job, looks great, and your step by step directions are clear and easy to follow….must be the teacher in you! Your temporary makeover option is such a good idea. Thanks for bringing that option to light. Patience is another teacher trait! In the case of the shower curtain, I’d vote for no shower curtain. Keep it open and light. Aw you’re sweet, Karen! I do miss the classroom sometimes. Thanks for the feedback! I vote for no shower curtain—that heater is too close for comfort! Thanks, Sharon! Although, no need to worry about that heater. We haven’t touched it ever and I don’t even know if it still works. Can’t wait for the day when we can have it gone! How about a barn door instead of a shower curtain you have a long wall before you get to the toilet, and could still put the cabinet there for storage, just roll the barn door behind it. Have you thought about epoxy coating your counters? I keep looking at that as a budget friendly counter option. That’d be a cute idea but since this is all a temporary refresh instead of a major renovation, we’re going the simple route. 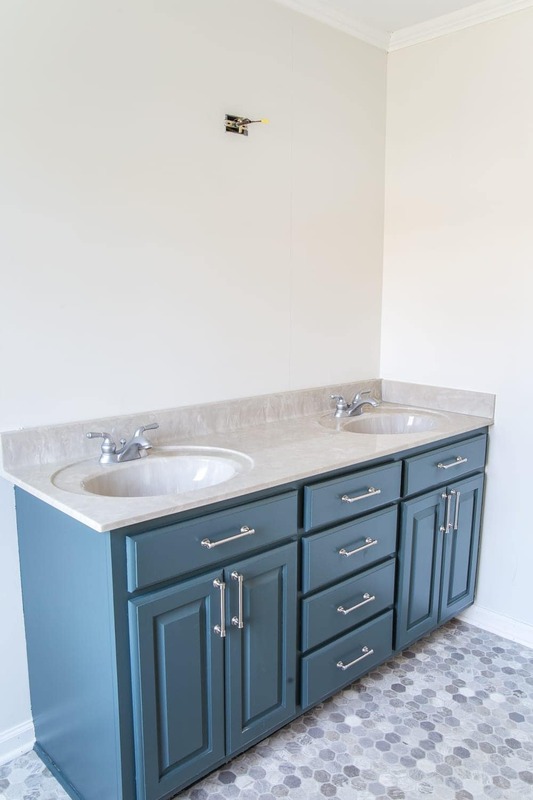 We did use an epoxy paint on our counters in our other bathroom a couple of years ago and it turned out great! But the fumes were so extreme that we had to vacate the house for a weekend. With a baby in the house, I didn’t want to subject her little lungs to that. It does work though! Looks great. I think a shower curtain would look fussy. The shower door looks fine and blends in nicely with everything else. Thanks for the feedback, Elle! Instead of a shower curtain, have you considered painting the silver metal black. I saw that done in another blog and it looked amazing! 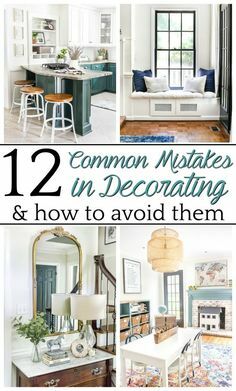 So funny story… I did that to one at our old house once and it was QUITE the mess. Haha! But I’m trying to steer clear of fumes with a baby in the house right now, and that would require spray paint. You make this feel completely doable!! Do you think sheet vinyl could be laid over existing vinyl? 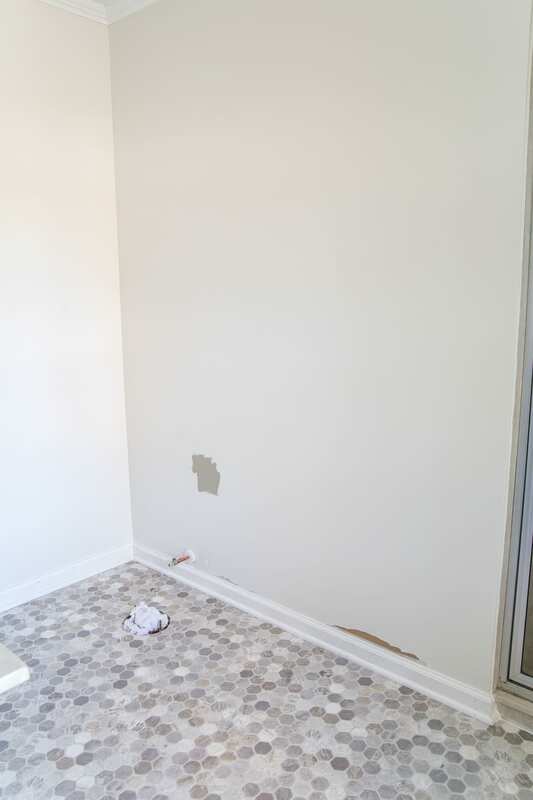 We have old sheet vinyl flooring with several small holes in our guest bathroom. I’d love to cover it up. Love the changes. I would hang a shower curtain/fabric that is cut smaller width wise and hung to the right not to function but just to add interest. It will darken the shower stall however. I have one on my shower just for décor and I can’t imagine not having it now. Good luck with the rest of the process, I love that this is a REAL doable makeover. Thank you so much! I might try that! We thankfully have a light right above the shower, so that does help. Guess I’m in the minority but I vote for a shower curtain. The current door is not especially high end and, in fact, is rather cheap looking (lol only saying that cause I know you didn’t choose it). Love the idea of a barn door but are you really going to go thru the trouble and expense for a stop gap measure? I think I might spring for a couple of curtains and try them out just to see. Can’t hurt! I can’t always take them back. 😉 Thanks, Denise! We also just installed sheet vinyl flooring in our Master Bedroom, and it is amazing how something so quick and easy can transform a room so completely! Thank you, Junette!! My thoughts completely!! Love the vinyl floor. I also really like the wrought iron painted doors in your home. Paint that bathroom door first before you go out and buy a shower curtain. The dark door will be perfect with the vinyl floor but may clash a bit with vanity color. Your posts are not only creative but inspirational. You have motivated me to paint my bathroom. 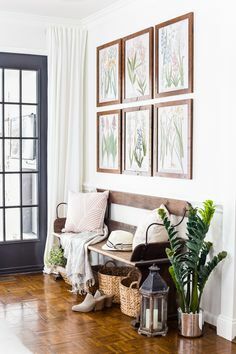 Last fall, I made the botanical prints you posted for my dining room and I laid vinyl tile in my small half bath. I got a lot of compliments on both projects thanks to you. Lauren, the floor looks amazing. I would consider hanging a curtain, but I just love fabric on anything. Also, my last home had a heater in the wall in all the rooms, and I painted them the color of the wall. It wasn’t a perfect fix, but did camouflage them a bit. Just an idea. Thanks for sharing, and your husband is a keeper! Can’t wait to see the end result. Yes! After looking at it, I’m going back and painting ours too. We don’t use it so I’ll do whatever I can to cover it up. the level of difficulty and possible pitfalls when you guys tackle something. Your room looks so nice, it will definitely make the gut job something you can wait for. I am SO obsessed with this flooring! Great find!! I really love all the posts about remodeling your new house, you have exquisite taste! Love the flooring! Now I want to try some in our entryway! I agree with painting the heater to help it blend in. Also, yes, at least try a few shower curtains to see what you think. If you choose a lighter color, I don’t think it will seem dark in your room. 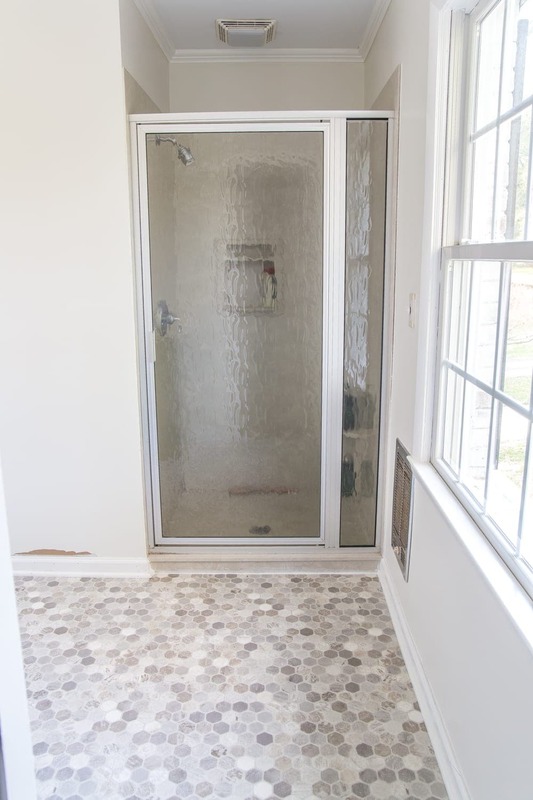 I’m not a fan of older style glass shower doors–seems like they are hard to keep looking clean and nice. But that’s just my take on it! Such a super idea and it looks flawless. Just wondering though what the floor looks like at the entrance. 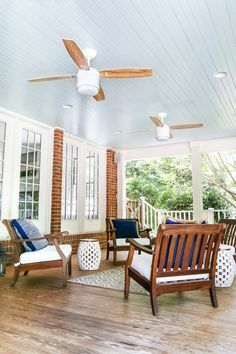 Is there a trim or transition piece between the two different floors . Thanks for sharing your very beautiful home with us. Debbie, there is a wood panel at the thresh hold. The vinyl sheets are so easy to cut. I cut the flooring to line up right along the entry. This looks great! Have you thought about removing the glass door and track all together? My husband did this to ours and I was hesitant, but it made the shower feel so much bigger! There is some type of compound that you can buy and have tinted to fill the holes. Each time I clean the shower I’m amazed that I can’t even see the compound, and it’s been two years! You’re brave to slap a new floor over the old! Just for readers to know – most contractors will charge you more if they have to pull up multiple layers of flooring. Of course, if you’re doing it yourself, you’ll just mumble a bit more..hehe. Haha! Yep, we’re definitely aware. The great thing about this particular vinyl though is that you’re not supposed to use adhesive, so it won’t really require any extra effort to pull it up. 🙂 And this is only temporary for a year or two until we do a full gut job in here. 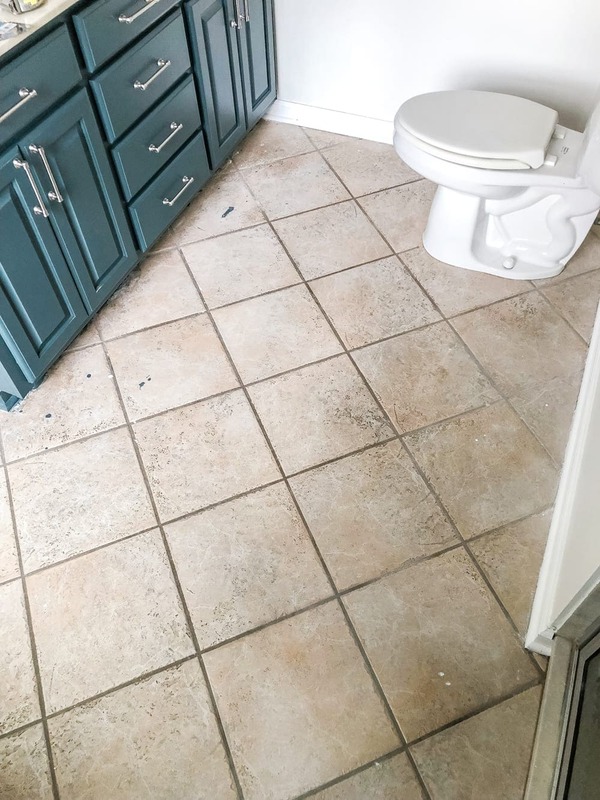 If this were a flip for resell, we would go the more pricey correct way of doing it by pulling up and replacing the old tile with new tile. Lauren do you think you can use the same vinyl sheet over linoleum? I absolutely love this! You’ve actually inspired me to tackle a refresh on our master as well to tide ur over until we can do a full gut job. I plan on doing the same floor but am wondering what you used at next to the shower? You mentioned vinyl edging but I’m not sure what that is! Do you by chance have a link for what you used? Thank you so much!